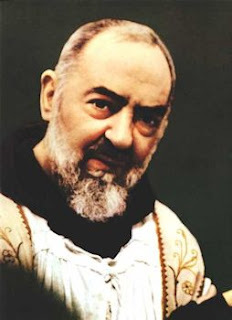 In this entry Padre Pio speaks to us of an experience which is so common to human life especially for those who suﬀer, he relates of his own extreme desolation and how diﬃcult it is to bear this agony; he describes it as being in a wilderness. 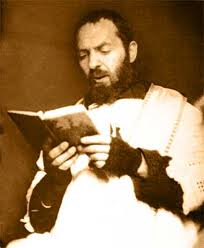 Yet, deep within his spirit, the padre is aware of a feeble light that penetrates and allows him to feel the presence of the Father. Notice that despite the agony and darkness of suﬀering deep within in the apex of his spirit he feels the stirrings a gentle spring breeze—this is a touch of grace from above. In all our suﬀerings if we be still before Him in Deep Silence and expectant faith, we will know His touch and the breeze of Heaven. “Our good Jesus has placed my soul in extreme desolation and I find it diﬃcult to think that I am living the life of God’s children. I am in a wilderness where my soul knows no comfort in these moments of trepidation and hope. Now and again a most feeble light penetrates from above, just enough to reassure my poor should that all is being directed by Divine Providence and that through joy and tears the heavenly Father is leading me by inscrutable secret ways to the end he has in view. This is nothing else than the perfection of my soul and its union with God. But then, alas, a little later my poor soul is plunged into a more tragic desolation than before. Thanks be to God that I have never experienced the "extreme desolation" of which the holy Padre speaks. It sounds terrifying! St Pio's words are a reminder to me that I am not alone -- that Jesus is always at my side, and wants me to trust in Him -- in whatever trial or suffering I find myself.